Is that old chair broken again ??? Well, this time I'll fix it the right way! You'll be able to say this after reading Repairing and Restoring Antique Furniture, first published in 1954 by John Rodd, a cabinet maker with over 50 years in the trade. Everyone has been guilty of applying the "quick-fix" to furniture, a nail here, a screw there, some super glue on everything, but this book will show the error of those ways. Repairing and Restoring Antique Furniture isn't just for restoration specialists, it is for anybody who desires to do a repair on any kind of furniture and do it correctly. John Rodd has been an established cabinet maker and restoration specialist in England since the 1920's and he shares the history of furniture repair in this book. Starting with the traveling restorers of the 1820's, Rodd takes us through the history of the art of furniture repair and restoration. Through the historical recollections and manuscripts of craftsmen past, we learn where certain techniques got their origin and how these methods of restoration, repair, and fine finishing have evolved through the years. Repairing and Restoring Antique Furniture has many detailed drawings of repair and restoration techniques, as well as tips from the old masters on how to get, and maintain, the fine finish of your best heirlooms. 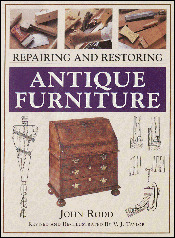 The craftsmen of this book will lead you through the steps involved in restoring and repairing damage to any piece of woodwork, not just antiques. In the pages here, Rodd has laid out the processes of dis-mantling, cleaning glue joints, repairing or replacing broken or missing parts, re-assembly, and finishing the piece to it's original (or better) condition. It is well written in an easy to understand and follow manner. Though originally penned in 1954, this book is still a valuable asset to the woodworker's library. This latest version has been updated with references to modern tools, adhesives, and techniques that have evolved through the years. I highly recommend acquiring Repairing and Restoring Antique Furniture, by John Rodd, for any woodworker interested in the history and practical application of the techniques used through the ages to maintain and repair antique and fine furniture. Here, also, is a good way to start the time line for the furniture you build in your own shop, as antiques have to start somewhere. After all, wouldn't you want your grand-daughter's first born to sleep soundly in that crib you lovingly made for your own child ?